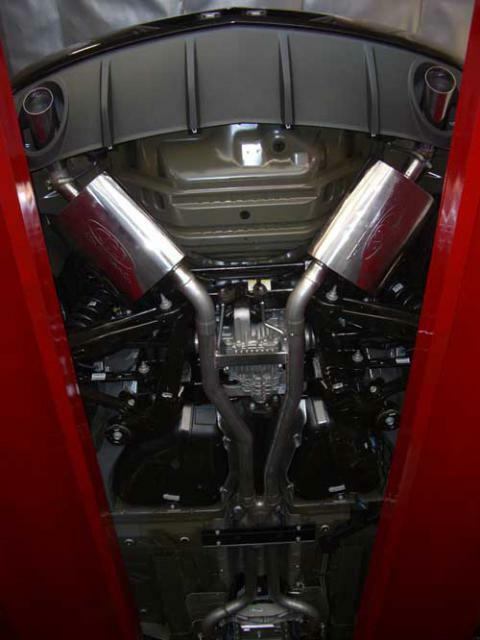 This CGS Cat-Back Performance Exhaust System for your Chevrolet Camaro is guaranteed to outlast and outperform every other cat-back system on the market. CGS uses 100% all-welded stainless steel high flow muffler, combined with mandrel-bent seamless tubing, and a polished stainless steel tip. 50 state street legal. Backed by a Lifetime Warranty this Chevrolet Camaro exhaust system will not affect factory warranty or emissions standards. This Cat-Back exhaust system is complete with a X-Pipe and Stainless Steel Tips. Great exhaust system. I have a 2012 Camaro Convertible and I research all of the exhaust systems for the Camaro and decided to go with the CGS system. I could not be happier. Great sound and power. George H. would recommend this product to a friend. These guys make a great system. I just bought the new Camaro and I love it but the exhaust had no sound. So looked on the internet for the best exhaust system for the money and I think I found it. What a great system, the sound is unbelievable. It sounds better in person than it dose on that video. The performance gain was unexpected. You guys really did your home work on this one. Steve H. would recommend this product to a friend.